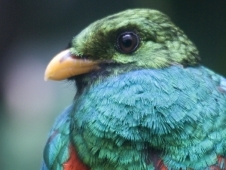 For centuries the Resplendent Quetzal dominated the traditions of the Indians of Central America and its legendary status survives in various forms today. There are indications that the species must have been very much more abundant in pre-Columbian times than it is today. For centuries the Resplendent Quetzal Pharomacrus mocinno dominated the traditions and beliefs of the Maya and Aztec Indians of Central America. Quetzalcoatl, the cultural force for good for both Mayas and Aztecs, was symbolised by the head of a serpent adorned with the feathers of a Resplendent Quetzal. The rulers in both cultures required tributes and head-dresses made of quetzal tail-streamers, but since the birds were considered sacred, the penalty for killing one was death; thus the birds were freed after the long plumes were removed. According to Aztec legend, Quetzalcoatl was supposed to return as god-king in 1519 to rule them, so when in that year the Spanish conquistador Cortez sailed into Vera Cruz harbour, it was hardly surprising that the first gift Montezuma sent him was a magnificent head-dress of quetzal plumes. At the height of the Aztec empire, five provinces which contained cloud-forest were compelled to furnish tributes in the form of as many as 2,480 “bunches” or “handfuls” of mostly tail-streamers from Resplendent Quetzals. If it is assumed that each “handful” contained 10–50 such feathers (four from each bird), this would have meant a harvest of 6,200–31,000 Resplendent Quetzals per year (Peterson and Peterson 1992)! Even if the lives of the birds were spared (and despite the edict of death on those who killed them, it seems inevitable that a large proportion might have been seriously injured in the capture/plucking process), the figure is still astonishing, and indicates that the species must have been very much more abundant in pre-Columbian times than it is today (classified as Near Threatened; BirdLife 2008). Quetzalcoatl's association with the Mayan god Kukulcan has recently been highlit by the claim that the pyramid at Chichen Izta, Mexico, was constructed in such a manner that sharp sounds made inside it produce an echo of a handclap that mimics the call of the Resplendent Quetzal. The echo is produced by the faces of steps in limestone staircases, and is suggested to represent the spirit of the Maya (Lubman 1999). This idea has been greeted with scepticism in some quarters, but echoes were often associated with spirits, and the central importance of the quetzal in Mayan beliefs make it entirely plausible that the pyramid-builders deliberately included such a device as a further means of totemising the species. The legendary status of the Resplendent Quetzal survives in various forms today. The name quetzal comes from the Aztec quetzalli, originally meaning tail-feather, and by transference “precious” or “beautiful”. Thus it is that the unit of monetary currency in Guatemala is the quetzal. Until fairly recently, old men of that country would kill a quetzal and parade it through the streets, to assure themselves another year of health. One small community annually wraps their statue of St Joseph in quetzal plumes and carries it through the village in solemn procession (Collar 2001). Collar, N. J. (2001) Family Trogonidae (trogons). Pp.80–127 in J. del Hoyo, A. Elliott and J. Sargatal, eds. Handbook of the birds of the world, 6. Barcelona: Lynx Edicions. Lubman, D. (1999) Singing stairs. Science News 155: 44–45. Peterson, A. A. and Peterson, A. T. (1992) Aztec exploitation of cloud forests: tributes of liquidambar resin and quetzal feathers. Global Ecol. Biogeog. Letters 2: 165–173.